Professor Reza Ghodssi (ECE/ISR) has been elected a Fellow of the American Vacuum Society (AVS), the oldest microelectronics processing, materials, technology and interfaces community in the world. Fellowship recognizes AVS members who have made sustained and outstanding scientific and technical contributions in areas of interest to AVS. 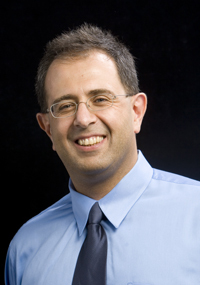 Dr. Ghodssi’s citation reads, "For outstanding leadership in microsystems technology achieved by combining knowledge of materials and processing, innovative device concepts, and diverse applications." Dr. Ghodssi joins three other University of Maryland faculty who are AVS Fellows: Maryland NanoCenter Director Gary Rubloff (MSE/ISR), Professor Gottlieb Oehrlein (MSE) and Distinguished University Professor Ellen Williams (Physics). Dr. Ghodssi will receive the Fellow designation at the awards ceremony during the AVS Symposium in San Jose, Calif., this October. Dr. Ghodssi's research interests are in the design and development of microfabrication technologies and processes in micro/nano/bio devices and systems for chemical and biological sensing, small- scale energy conversion and harvesting with a strong emphasis toward health monitoring applications.